Cellular / Honeycomb shades are very versatile. The applications are endless. These shades can be used on sliding patio doors, skylights and even angled and arch windows. There are also many control options. Below is a description of some of the options that are available with cellular shades. Click here for a gallery of cellular shades. The shade operates with a simple pull cord that can be locked in any position desired. This is the most cost effective control option. This option functions just like the cordless lift. The difference being on the handle there is a button that is depressed when the shade is lowered or raised, once released the shade stops and locks at this point. This is a good option for shades that are easy to get to and reach. Higher windows or windows with obstructions would need the standard cordless lift. This option is typically used on shades that are higher or out of reach. It also works well on larger, wider or heavier shades, helping to raise them smoothly and evenly and eliminating the dangling cords. The cord loop is attached to the window for child safety. This also creates a neater appearance. This is the ideal solution for windows that are hard to get reach. Skylight shades can also be motorized. Motorized shades come battery powered, Battery/solar. Low Voltage (Plugged in) or hard wired (Line Voltage) they can be operated by wall switch, remote controlled or work with smart phones or tablets and operated by devices such as Alexa or Google home. Motorized shades can also be easily intergraded into smart homes. This technically isn’t a control option. 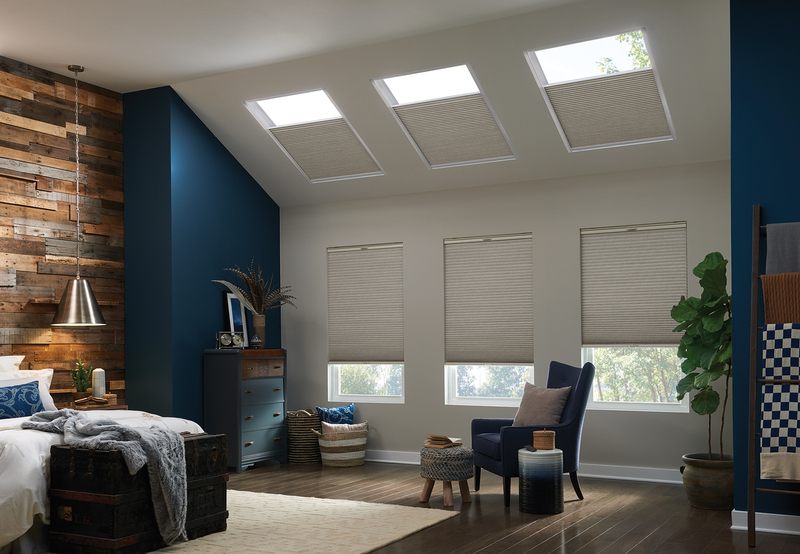 These shades can either pull down like a normal window shade or lift up from the bottom leaving the top part of your window uncovered. This option is very popular on street facing windows, windows above bath tubs and on second floor windows. These can either operate with standard cordlock, cordless lift or cordless lift. This option allows a Honeycomb shade to slide vertically with minimum stack. This option is ideal for sliding doors and windows. This option does tend to create more of a contemporary look. These shades typically install with slim side rails to prevent the shade from sagging into the room. The shades are mounted at the top and or bottom. The shades slide back and forth with ease by hand or an extension pole. Motorization is also possible with skylight shades. Cellular shades are very “flexible” as the can be cut to fit many specialty shapes. Some operable and some fixed. This includes Arches, angled top even hexagon windows. Here are some examples. This shade configuration consists is much like a Top down bottom up shade, but instead of the upper part being open this has a shade fabric. For example a window can have a blackout fabric on the bottom half and a sheer fabric on the top. It is essentially having two shades in one window. This option allows two separate shades to be built on one head rail. Perfect for large window openings with multiple windows. Comfortex’s Insulating SlumberShades have an integrated side track system that seals off the gaps between the shades and windows to create a solid insulating barrier to drafts.